As the best cosmetic Dentist Eugene, OR has, at North Eugene family Dental all new patients that mention this ad when scheduling their new patient exam will receive a Free Philips Sonicare DiamondClean Electric Toothbrush with paid comprehensive exam and any necessary x-rays! 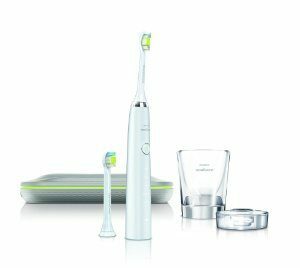 The most advanced Philips Sonicare toothbrush yet, the Philips Sonicare DiamondClean features an advanced new handle and high density, diamond-shaped bristles. Studies have shown that the DiamondClean removes up to 100% more plaque than a manual toothbrush in hard-to-reach areas. Patients who use the DiamondClean toothbrush will achieve an exceptional level of clean teeth and fresh breath for improved oral health and noticeably whiter teeth after just one week of use. Sonic technology – dynamic brush action drives water between teeth and along the gum line, helping to create a healthier gums. DiamondClean brush heads – diamond-shaped bristles offer a larger surface area for improved cleaning. Five brushing modes – includes polish, whitening, stain removal, and smile brightening modes. Smartimer & Quadpacer – encourages equal brushing in each of the four quadrants of the mouth and reinforces the recommended two-minute brush time. Just complete the quick sign up form below or call 541-343-5512 to schedule your appointment and get started today! Be sure to mention offer code GOOGLE-TOOTHBRUSH when you speak with our representative. Act now -this is a limited time offer. *Some terms and conditions may apply. At North Eugene Family Dental, we offer a wide range of services. Dr. Kirchmeier strives to be the best family and the best cosmetic Dentist Eugene, OR has. His friendly and professional staff place the comfort of every patient as their number one priority. We are committed to providing the Eugene, Oregon community with very best in family dental care, and use the latests dental care technology to ensure that each visit to our office is a quick, comfortable, and convenient one. Call today to schedule your next dental appointment, and see for yourself first hand the North Eugene Family Dental difference. Offer only available to new patients who complete a paid dental exam and x-rays. Exam and x-rays must be scheduled at the same time in order to receive the toothbrush. Toothbrush provided as part of the offer may differ from the one shown above. This offer has no cash value. Good while supplies last. Limit one toothbrush per household.